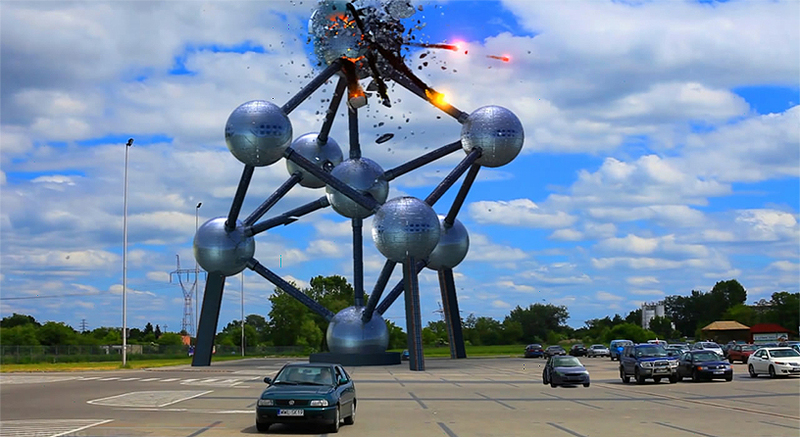 No worries, Atomium building is still there , it is just a great CG job by our friend Przem Sacharczuck using Pulldownit plugin in Maya. He kindly explain some details about production in this article. Well, Im not a theoretician about CG effects and instead talking, I want simple doing it! I promise to write something about this video, I`ll try to be brief. This project its my personal challenge, last season I was almost full time spending for testing wide range of simulations so called VFX. Im a fan of all present visual effects in movies, they are improving very fast in last years. I like to know how effects was made, all workshops and making-off`s are very helpfull specially for a begginer in the field. Actually im training on Autodesk Maya, it is an usefull software able to almost anything in 3D, sadly Maya built-in shatter doesnt work so Pulldownit plugin is a powerfull add-on to Maya for dynamics effects. In last year I was looking for good plugins, but not many working as I wanted, some plugins generated very poor, unnatural shards, some others have issues when computing dynamics. I find Pulldownit is the best destruction tool for Maya so far, it is fast and stable and what is interesting Pdi offers ways to make different ways of breakings, as wood, glass and concrete, it is very flexible for every kind of destruction needed! First of all- Im decided to make camera tracking to get more realistic result for scene- environment. 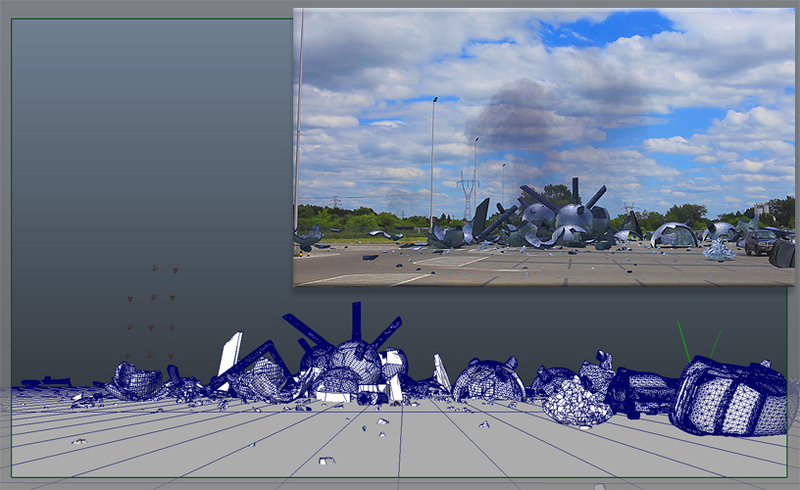 I find it getting better result than building all scene from scratch, I needed also some tools for motion tracking & camera tracking. Softwares which offers that possibilities are Matchmover, Boujou and CameraTracker. For best tracking and to avoid any issues in quality of recording scene, this was taken with Canon EOS mkII in full HD quality. The rest of the project I made mostly In Autodesk –Matchmover, Maya and After Effects for final compositing and color correction. Finally this scene tooks me quite a lot of time to be done, about Pdi, I had to simulate and check several times for the best way of simulation. 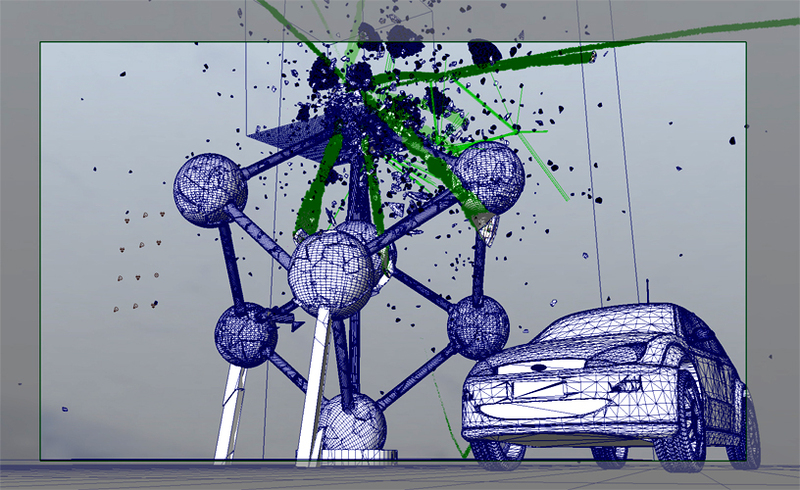 About Pdi simulation in Atomium I made 3 levels of shards, meteor, top of Atomium and bottom level. Finally I used advanced Pdi fractures for adjusting breaking resistance in diferent levels. 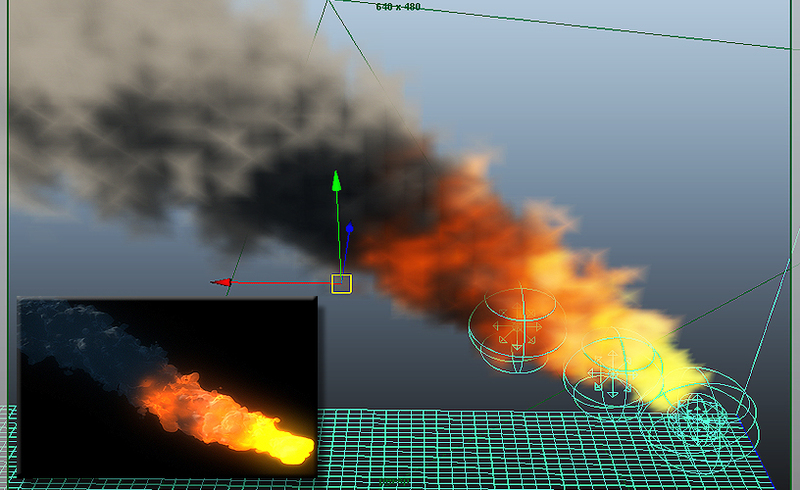 The rest of effects in Maya also tooks me some time, especially make the cloud blasts. Maya fluids needs lots of Ram and fast graphic card! This scene have two fluid containers which working separately. 1st res. is about 70×3, and for shards very dense about 100x150x70. The flying meteor at the beginning of the clip was made in box~100x150x70 container with 3 different emitters: fire, burn and smoke, It took me some time to adjust emitters for getting the final look I wanted for the wake of the meteor.